Cellulite is nothing a serious health condition. It is just fat deposited within the fibrous connective tissue under skin. But, cellulite creates a dimpling and nodularity effect to the skin. This is because the deposited fat pushes the connective tissue. The deepest trouble with cellulite is, with growing years it becomes stubborn. Thus, shading the fat becomes too tiresome and intricate for the individuals. Notably, this happens mainly to the ladies as men and women display some clear differences in their biological layout. Most interestingly, in a woman’s body these fibers create a shape of honeycomb whereas for a man they run in horizontal ways and generate criss-cross shape. Apart from creams, the best way to reduce cellulite on thighs is to make some lifestyle changes and improving fitness. When you are in a mission to cut off the cellulite fibers, you have to walk for miles to make your lower portion of the body active. Make sure to walk for at least 45 minutes in day. However, walking for an hour is ideal. But remember all of a sudden if you begin walking for miles then you will end up hampering the muscles. So plan the regime and start from today. You have to involve yourself in doing some sorts of power moves including weight lifting. It will help the sturdy fibers to expand thus the end result will be quick enough. This happens to be the best way to reduce cellulite on thighs. In this exercise, three types of muscles, namely the quadriceps, hamstrings and glutes will be worked on. By practicing it regularly, you can have lean thighs, though you need to invest quite a lot of effort and time. Place the hands on the hips and keep the feet apart. Keep the head straight. Now, keeping your back in flat position, bend your knees slowly. When the thighs will be parallel to the ground, stop and retain the position for a few seconds. Come back to the original state. You can make use of dumbbells n both the hands in order that the exercise will be more effective. There are many health benefits of apple cider vinegar. 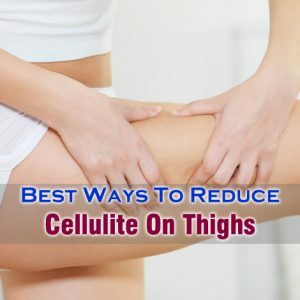 It also helps in reducing cellulite. For reducing cellulite, you have a mix one portion of apple cider vinegar and two portions of water, and apply this mixture to the thighs. Rub it thoroughly and leave it for 30 minutes. After that, clean it with warm water. Repeat this process twice a day until you get rid of cellulite.